You might remember I posted a blog a while back called Back in Texas! It talked about how I kept a big surprise from Joni. Thursday was the day I revealed the surprise to Joni. Here’s a bit of the post to refresh your memory. I’ve been keeping a secret from Joni for a while now and she finally found out the morning Dave and I took her to the airport. We left the apartment at 5am and I brought a pillow with me in the car. When we got to Gimhae Airport to drop her off, I was still holding my pillow. She laughed and said, “You’re taking your pillow in?” I opened the trunk and said, “That’s not all I’m taking in!” and pulled out my giant fuchsia suitcase. Dave had secretly loaded it that morning before she woke up. She had no idea that I was flying back with her. She was so surprised and so happy! I had such a great time with Joni in Korea. It was so exhausting, but I loved being able to show one of my very best friends this place I call home. 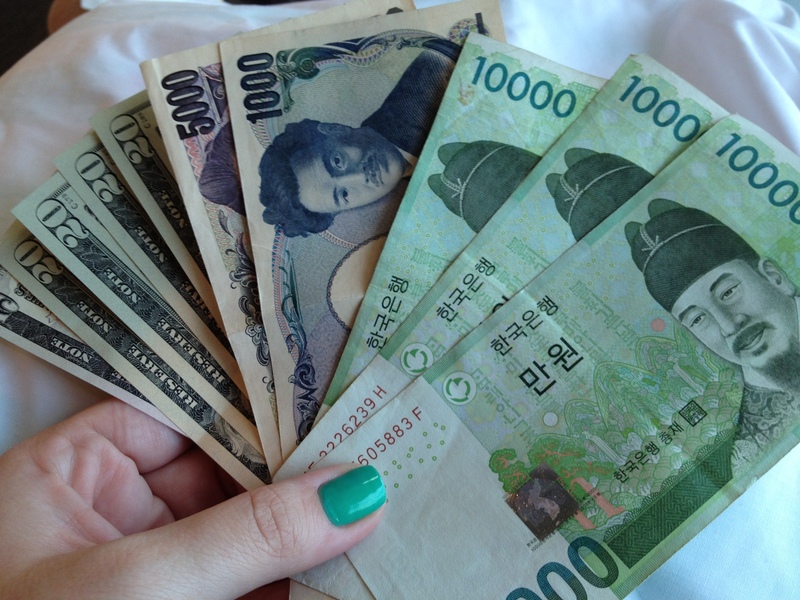 At the airport we exchanged some money so I ended up walking around with 3 different currencies. I loved Korea, Dave and you. Wish I could teleport so I could see more often.